1. What’s the difference between an assistance dog, a service dog and a companion dog? 2. How much do service/companion dogs cost? 3. How is a Good Dog! chosen for my child? 4. Can Good Dog! train a family dog or a rescue dog? 5. What type of training is involved with a Good Dog! our child and our family? 6. What if we have trouble or questions once our dog is home? 7. Do you train service dogs for other disabilities/special needs? 1. What’s the difference between an assistance dog, service dog and companion dog? Assistance dogs are dogs that have been selected and trained to aid individuals with disabilities. Assistance dogs are trained to perform specific tasks to help mitigate an individual’s disability and may include: service dogs, guide dogs, hearing alert and seizure alert. Autism service dogs are therefore assistance dogs under the service dog category. Assistance dog tasks fall into three basic categories: basic obedience, service tasks and public access. Autism service dogs are usually (based on the needs of the child) taught all three types of assistance dog tasks. An autism companion dog is just a label given to some autism service dogs by certain organizations who wish to distinguish them from other types of service dogs. Historically service dogs are trained to help persons with physical mobility tasks, like opening doors and retrieving keys. Because the field of autism service dogs is relatively new and because they serve very different functions, we choose to call our dogs Autism Companions. Good Dog! Autism Companions are service dogs as defined by the ADA or Americans with Disabilities Act which governs the use of service dogs to assist people. The ADA also outlines where dogs can be taken and under what circumstances. (It is important to mention however, that the presence of a dog solely for comfort or protection does not qualify it to be a service animal). There are many types of programs available from different suppliers and trainers of dogs. There are some organizations that grant dogs free of charge and others that ask families to help raise anywhere from $9,000 to $30,000. There are advantages and disadvantages to all options. The right choice depends on your individual needs and desires. Our mission is to help you determine the type of program that best suits your particular needs. How much does it cost to change a life? At Good Dog! we need to raise between 26-30,000 to raise, care and train each dog as well as educate and support each family. 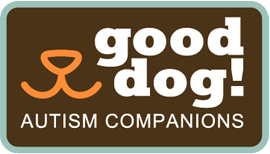 The fee for a family to receive a service dog from Good Dog! Autism Companion is $16,000. We provide fundraising coaching and resources to assist each family raise the funds. We also have a pay-it-forward program where we help graduate families host a community engagement event to benefit another family waiting to receive their service dog. Based on the tasks you would like the dog to perform, the special requirements of your child and your families activity level and desires, we select a dog with just the right temperament, personality and abilities to meet your family’s needs. 4. Can Good Dog! train an existing family pet or a rescue dog to be my child's service dog? No, we no longer provide this service..
5. What type of training is involved with a Good Dog!, our child and our family? Our family and education program is a 3-step program. It starts with required reading and online classes while your dog is being trained and selected for you. Once dog training is complete, the main handler (usually a parent) will come to San Diego for 5-day Team Training. This is an amazing time when the trainers will work with you in groups and individually to help you understand canine behavior and teach you how to work with your new family member. After Team Training, the team will return home together! We schedule a series of check-ins to make sure all is on track at home. Your training will conclude with the team passing both the Canine Good Citizen Test and a public access test. 6. What if we have questions or issues once the trainers leave our home? All Good Dog! Autism Companions come with FREE email and phone follow-ups for as long as you own your dog. 7. Do you train dogs for other disabilities/special needs? Although Good Dog! specializes in autism service dogs, our trainers have experience training service dogs for many different disabilities and special needs. Just give us a call and we can discuss your needs. If Good Dog! is not the right organization for you, we will refer you to the organization that is.